At the time of the birth of my first, I was thirty six and determined to be as well nourished and physiologically balanced as possible to feed her with gusto without depleting my self, so I hungrily ploughed through research for information that was surprisingly not readily available. The initial long days and nights during those first few weeks of almost-hourly feeds were spent feeding baby with one arm, while one-handed typing and research-article-page-turning with the other. Going through this experience of baby-making and feeding myself has been eye-opening, and I’ve been especially bewildered by the lack of information available, especially in regards to optimising milk production while simultaneously supporting the mother nutritionally and hormonally. Here are a few snippets of my findings; the topics I’ve found particularly interesting and the insights that have helped me personally through pregnancy (more here) and the early days of motherhood. I can only go into so much detail in this post: pregnancy being a delicate and personal subject, I reserve the intricacies and specific advice for clients I consult with one on one, based on their individual needs and health history. Although mainly referred to as the hormone secreted during pregnancy for its role in milk production, prolactin is also an inflammatory, adaptive hormone produced by stress. And in regards to lactation, it’s action is to break down bone to find calcium for milk. For want of a better word, it’s quite literally dissolving the mother! (this is a good watch) Postpartum, prolactin may also account for the hair loss many women experience if protective progesterone drops off too dramatically. It’s natural, and in fact necessary, that prolactin levels are higher than normal during pregnancy and if breastfeeding. However excessively high levels need to be addressed, especially if combined with elevated estrogen, stress and malnutrition, and the effects of it compensated for through adequate nutrition; namely calcium replacement, and enough calories provided to counteract stress. Salt is extremely important during pregnancy as well as postpartum, as noted by Tom Brewer in his research into pre-eclampsia in late pregnancy. If you consider that salt restriction leads to increased serotonin (also inflammatory), which in turn increases prolactin, that then increases salt loss in the urine, which leads to further serotonin production … you can start to see how there are some vicious cycles at play when key elements are restricted in the diet. Interestingly the osmolarity-disturbing effect of consuming too much plain water will increases prolactin too, while salt tends to correct this. Another reason I recommend additional fluids rather than just plain H2O in most cases. When you add to this the fact that most women are already estrogen-dominant and that estrogen also increases prolactin while inhibiting the absorption of calcium, there should be no doubt that optimizing nutrition to correct this, pre, during and post pregnancy is a must. Keeping your estrogen in check with healthy progesterone production is also important for staving off postpartum depression. Encourage estrogen clearance by supporting liver detoxification (the liver needs sugar and protein to function), minimise polyunsaturated fats and keep endotoxin down (step 1: start with a daily carrot salad: recipe here). And the best weapon against unsafe estrogen levels: some supplemental natural progesterone. It will encourage more of your own endogenous production too. Post-partum, so long as your milk production is fully established, it’s safe to use. The best product available is still Dr Peat’s Progest-E. Read up about it and order it here (and you can use code EMMA5 for 5% off). Vitamin B6 is also good for lowering excessively elevated prolactin: liver is an excellent source. Make a batch of Pâté once a fortnight. Keeping my temperature elevated (between 36.6 and 37 C) a sign that thyroid hormone is being converted efficiently, has also helped me manage stress hormones during this time. In hypothyroidism as well as in the case of estrogen-dominance, prolactin is elevated, so just imagine the stress to the body for a woman going into pregnancy already in this stressed state. Healthy thyroid levels are closely tied to fertility; I’ve helped “make” babies over the years in practice by correcting hypothyroidism. The best methods for testing thyroid are clinical symptoms in conjunction with body temperature and pulse. I assess my clients using these methods (as well as lab tests if necessary) and teach them how to monitor temperature through the day and rectify their damaged metabolism with better food choices. The protein and calcium of milk, especially in combination with sugar, both help to increase the metabolic rate and temperature also. Aah, those pregnancy cravings for cheesecake and gelati are making perfect sense now! Coming back to calcium (for down regulating the inflammation of prolactin and maintaining bone mass), choosing protein sources that have a high calcium to phosphorus ratio is key. For example dairy naturally has this ideal ratio while muscle meat is high in phosphorus (another reason to eat meat with bone broth). Also worth noting other calcium-poor, phosphorus-rich foods to limit: grains, nuts, seeds and legumes. Eggs would have an ideal ratio if we ate them shells-and-all! Which is why I keep my eggshells for making eggshell calcium powder. Otherwise, eat your omelet with cheese! Some great reading on understanding this integral mineral-balance here. In fact, energy intake should increase by at least 200 calories during pregnancy and 1000 plus during nursing. I did best consuming 2,500 calories plus. It’s important when trying to get maximum calories and nutrients that the foods are of course nutrient-dense but also pro-metabolic and digestible. That means limiting cellulose (especially raw insoluble fiber), things like rough leafy salads, gritty whole grains and gassy legumes, and other things that challenge and complicate digestion, trigger inflammation, and just fill you with bulky roughage that will feed bacteria but not you. And regarding the nutrients required, we’re talking food sources with all their naturally-occurring co-factors, rather than supplements unless absolutely necessary, assessed individually. Hmm, interesting don’t you think? I think it’s a bit of a worrying sign of the times that when people have seen me with my newborn, many times the reaction has been: “gee you look good and slim for having just had a baby” like that’s my goal. If anything I’ve been trying my best to retain weight for backup to support me through breastfeeding. In saying that, I’ve worked my metabolism (preconception) to a place where I can consume adequate calories, without gaining excess weight. Although some fat stores wouldn’t go astray. Immediately postpartum is definitely not the time to be restricting calories or stressing the body with high intensity exercise, breastfeeding or not. Your body is in a compromised state. This is such an important time to be taking it easy; replenishing, resting, recovering. And if you haven’t ditched that unhealthy carb/sugar phobia already, do it now. Re-read my sugar article from last year here. Most women I see, pregnant and non-pregnant women alike, are paranoid they are eating too much, when in fact most are not eating enough! Rather than restricting calories which suppresses the thyroid and elevates stress, when they eat more food, the right pro-metabolic foods (and avoidance of anti-metabolic PUFAs), they accelerate their metabolism, support healthy hormone production, and decrease stress. Dairy foods (the type that you personally digest best), orange juice and salting food to taste helped me enormously. And again, eating enough calories in general. I found it a wee bit nerve racking at first to just be patient and trust that my milk supply would meet my baby’s demand, but with everything I was doing and her persistent suckling, it did all synchronise eventually. Low milk supply postpartum, most of the time, is to do with insufficient fuel, and/or low thyroid, and/or estrogen-dominance. To improve milk supply, rather than eating ‘lactation-promoting’ foods like flaxseeds, oats, fenugreek, red raspberry leaf tea etc that promote prolactin by way of their estrogenic actions. I realize now that talking about sleep to a new mum (especially one with multiple kids) is cruel irony, but if you could forego other activities (ditch the non-essential house work for as long as possible!) and take every opportunity to at least nap whenever you can, it’s probably more important than anything else. See it as a necessity, not a luxury. Darkness and sleep deprivation are both stressors in themselves, so to a body that’s already in a compromised state, sitting up through the night with an unsettled little person is stress compounded. Also factor in that sleep loss effects metabolism (lowers it). Daily exposure to natural full-spectrum light for both mum and baby is essential for so many reasons: increasing thyroid, decreasing stress, manufacturing Vitamin D, establishing circadian rhythms and improving night time sleep quality (if that’s possible!). If I couldn’t muster up the energy for a walk in those early week, at the very least I’d feed her on the balcony early in the morning. During the day I would lie out in the sun, baring some skin, with my baby in filtered natural light, part-shade in the summer. Red light therapy can also be beneficial at night for reducing stress and elevating morning temps, and evening Epsom salt baths too. 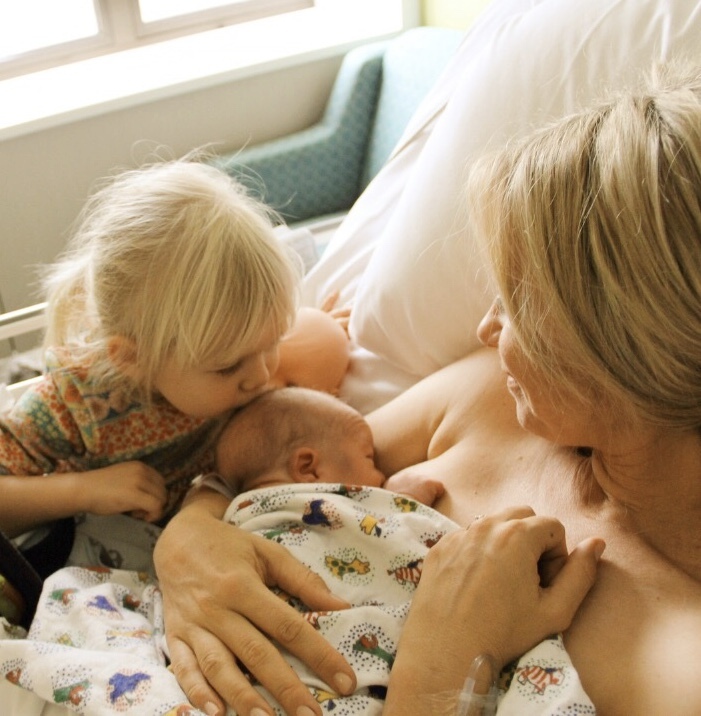 For me, feeding on demand through the night for all those years with my two, co-sleeping was necessary and worked for us. But every mother-child needs to find the arrangement that works for them. … is to remember the most important thing: time connecting with your babies while they’re so small … trying not to do so much, politely saying no to those non-essential engagements, and accepting help from family and friends. The Australian Breastfeeding Association which incidentally was founded by my lovely Great Aunt Mary Paton! Metabolic Toxemia of Late Pregnancy – Tom Brewer, M.D. Audrey, eggshell powder (highest quality calcium carbonate) will be a must for you. Collect eggshells over a few days of egg-eating, in a container in the fridge. Peel out and discard the inner membrane if you can be bothered. Put your collection of shells in a pot of water on the stove and simmer for at least 10 minutes. Strain and lay out on a baking tray to dry out in a low oven for around 15 minutes or so (until shells are dry and brittle but not browned). Grind to a fine powder in a coffee grinder (you can buy these for next to nix at any kitchen store). Keep in an airtight container. You’ll want to have 1/4 tsp at least 3 times a day. It’s easiest to put it on the back of your tongue them swallow quickly with half a glass of water/juice. Hi Emma. It is a delight to see you have returned to blogging. 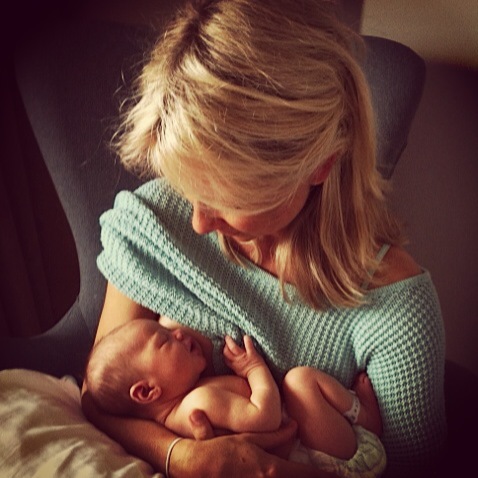 Olive looks gorgeous – congratulations. I recently caught up with a cousin of yours (relative of mine too) at a family funeral. She told me about your blog and I have enjoyed reading several of your wonderfully informative articles. I look forward to reading many more in your archives and new ones too. Regarding rest while having many young children in a family – well for me it just never happened. I seemed to spend many months in a sleep deprived manner, certainly not ideal but with no other option. We have 8 children, including one set of twins. Our children are now aged 5 to 21, all still at home and homeschooling the younger 6. I am finding you information on diabetes particularly interesting, having been diagnosed with gestational diabetes from early on in my first pregnancy. Your ideas on PUFA are new to me and one I hope to look into further. thank you for your kind message … and so we’re almost related?! Wow, 8 children; You’re doing well to get any sleep at all! Thank you Emma. That was very interesting to listen to. I managed my “gestational diabetes” through diet and self-monitored reasonably carefully but not being overly worried. From memory the levels at which gestational diabetes is diagnosed has decreased over recent years to classify more women as needed to be watched and “high risk”. After a while you become a little cynical. The link drawn between brain development and glucose levels is fascinating. There is so much which we have been told is truth, only to discover quite the opposite years later. Hi Sarah, a bit of mashed ripe banana for your son is probably fine, just don’t over do them, and encourage a more varied diet. As put by Dr Peat: “some fruits, including bananas, pineapples, and tomatoes, contain enough serotonin to produce physiological effects in susceptible people.” Stewed pears and apples are good safe choices, and lychee and papaya are great tropical fruits. Again it depends on the person, your son’s age and symptoms etc. but you’ll be able to tell if he’s sleeping well and seems calm as to what the right fruits for him will be. Can you tell me any more about red light therapy – i.e. is there a red light product that can be bought to use/have on at home? Anything in particular you would recommend? Previously, I only knew about red and blue light therapy as a clinic treatment for skin conditions like acne. Gradually increasing my time in the sun over summer, without ever burning, had me feeling really good, so I’m really interested in light and vit d, in terms of hormone balance, supporting thyroid function, etc. Thanks for the link Emma; yes I really like the “baby-lead” approach to feeding … makes sense to me too. Olive is now 8 months and has had no interest in anything mushy at this stage, in fact the only food she’s been keen on so far is meaty lamb chop bones that she’ll gnaw on with gusto! I’ll trust in her instincts.